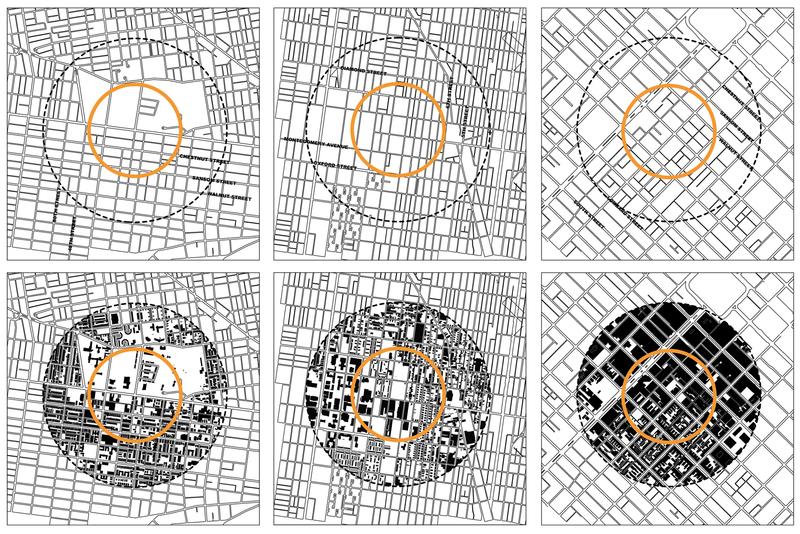 Figure-ground diagrams of the urban fabric within half a mile of the 46th Street Station (left) and the Temple Regional Rail Stop (middle) reveal a significantly more discontinous use pattern than is evident in Center City development patterns (right). 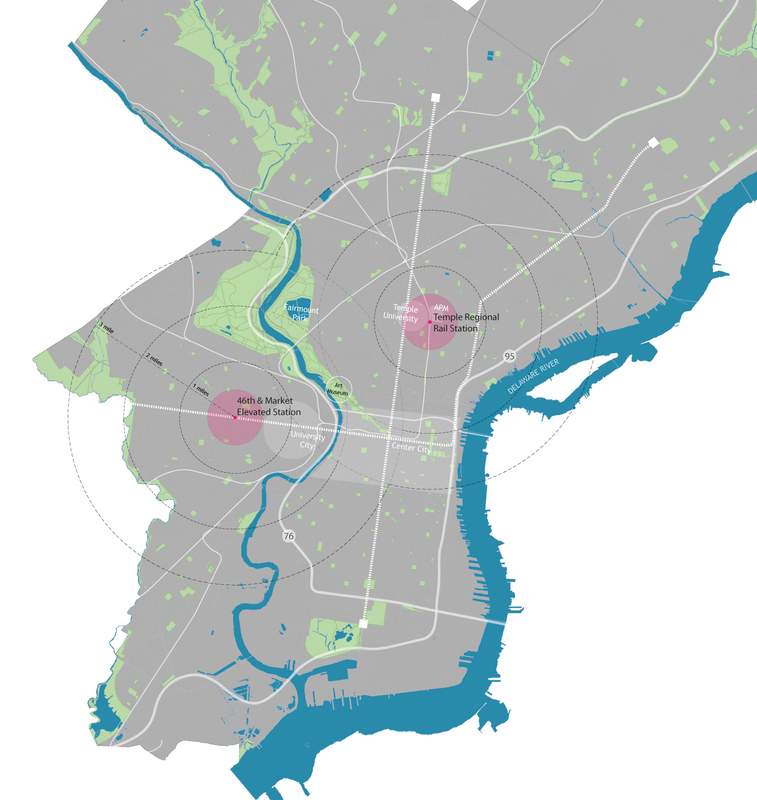 Location map illustrating the targeted stations in the City of Philadelphia. Plan view showing transit-oriented development build-out scenario and associated and public realm improvements for each station. Managing stormwater runoff. 45th and Market streets (46th Street)—Opportunity sites for proposed rain gardens coinciding with the former course of the historic Mill Creek. Managing stormwater runoff. 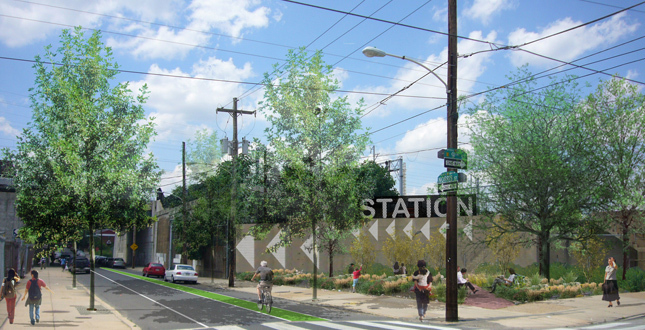 45th and Market streets (46th Street)—Proposed green gateway treatment using rain gardens. Managing stormwater runoff. 9th and Norris Street (Temple)—Potential improvements with rain garden, colored bike lane and signage. Integrating recreation space. 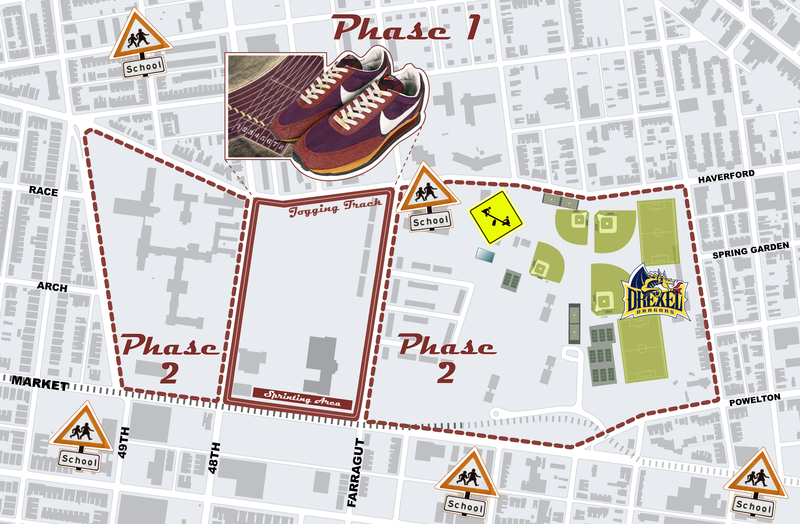 North 46th Street Running Track (46th Street)—Adjacent to a concentration of schools and the Drexel Fields, this Market Street superblock in an ideal location for a running track. Integrating recreation space. 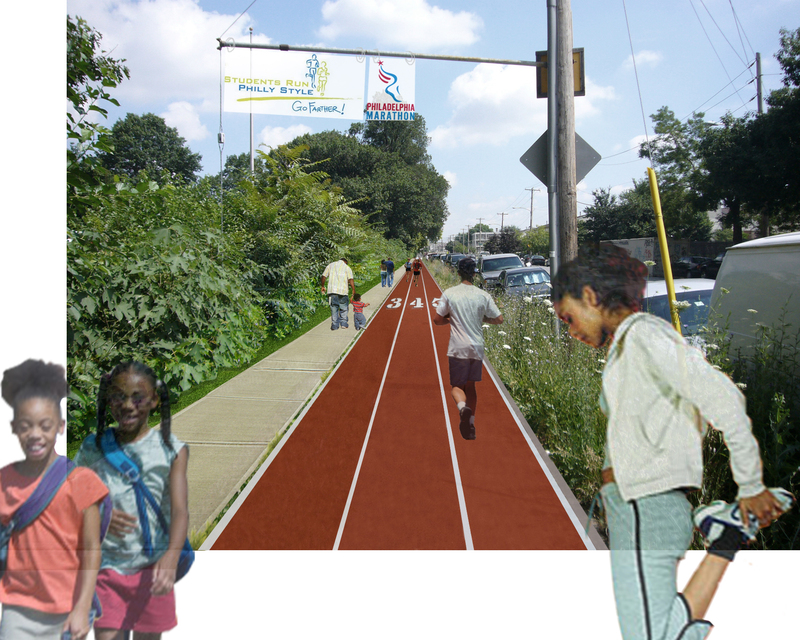 North 48th Street Running Track (46th Street)—Phasing plan for the implementation of the block perimeter running track. 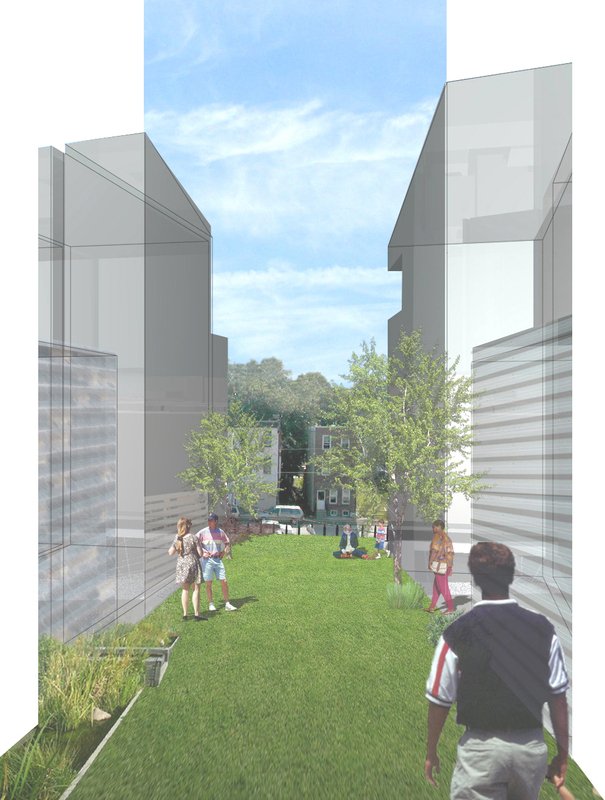 ReImagining infrastructural elements, Westpark Apartments (46th Street)—Proposed landscaped entry to Westpark Apartments from Market Street. 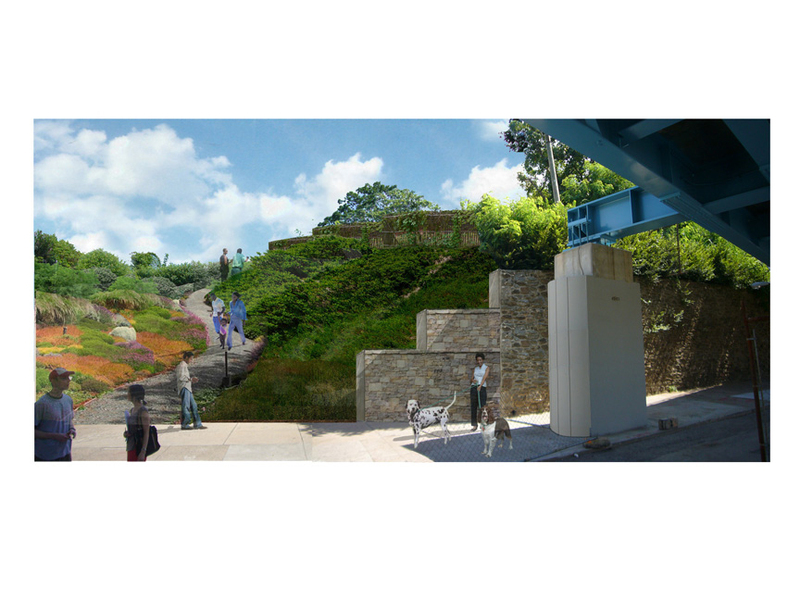 ReImagining Infrastructural elements, Vladuct as Tree Nursery (Temple)—Potential reuse of viaduct as tree nursery and open space transforms this infrastructure into a permeable asset to the community. 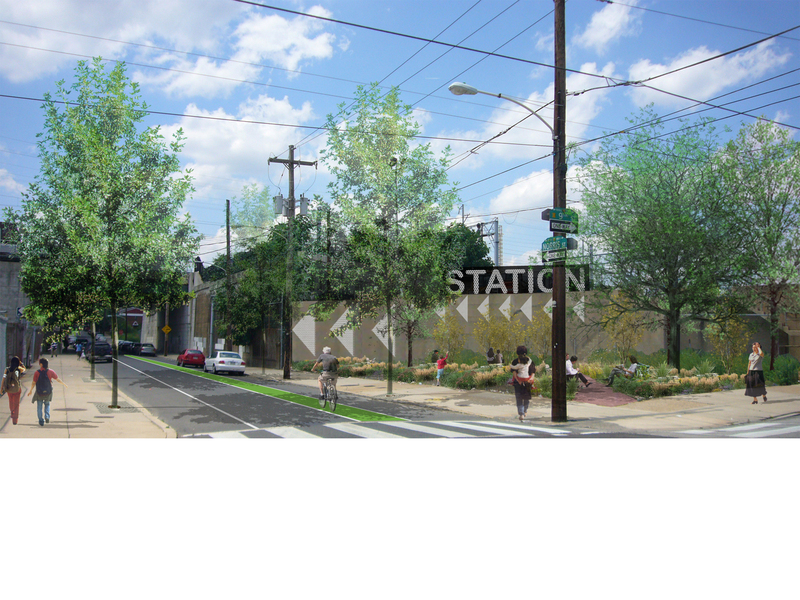 Enhancing connector streets, Temple Regional Rail Station—Plan view showing existing tree coverage and proposed priority streets for plantings and other streetscape enhancements to improve access to the station. 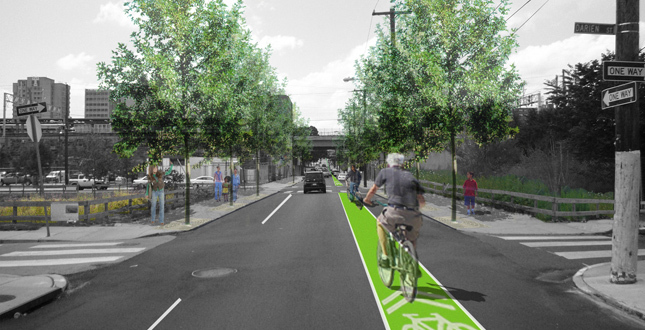 Enhancing connector streets, Darien and Norris streets (Temple)—Proposed streetscape improvements and colored bike lane create a more visible and pleasant passage to the Temple station. 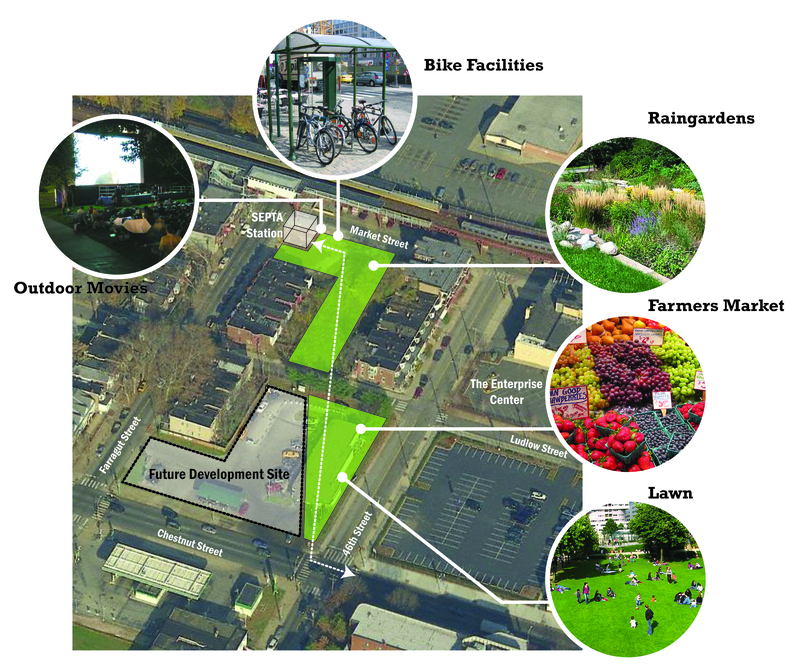 Creating civic space at the doorstep of each station, 46th Street Station Linear Park (46th Street)—Conceptual diagram showing potential programming for a proposed linear park creating a meeting place for neighborhood residents as well as providing a more pleasant means of accessing 46th Street Station. 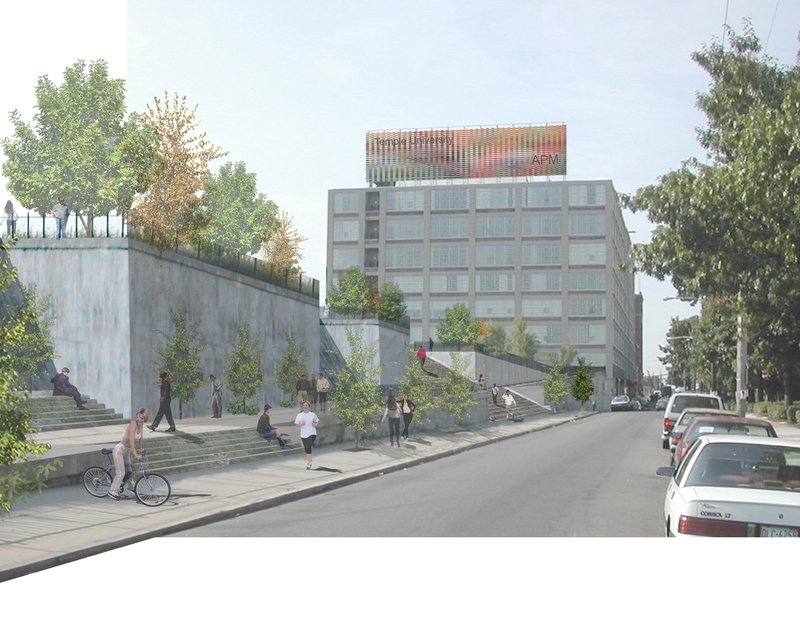 Creating civic space at the doorstep of each station, 9th and Berks streets (Temple)—Proposed green roof pedestrian “allées” perpendicular to the Temple rail between new mixed uses developments on an opportunity site currently used for parking. 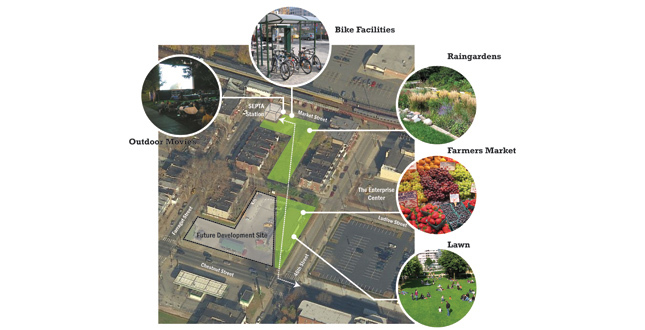 Creating civic space at the doorstep of each station, 9th and Berks Streets (Temple)—Extended station plaza. Although Philadelphia's transit system is the nation's fifth largest, many stations are underutilized and physically disconnected from nearby neighborhoods. 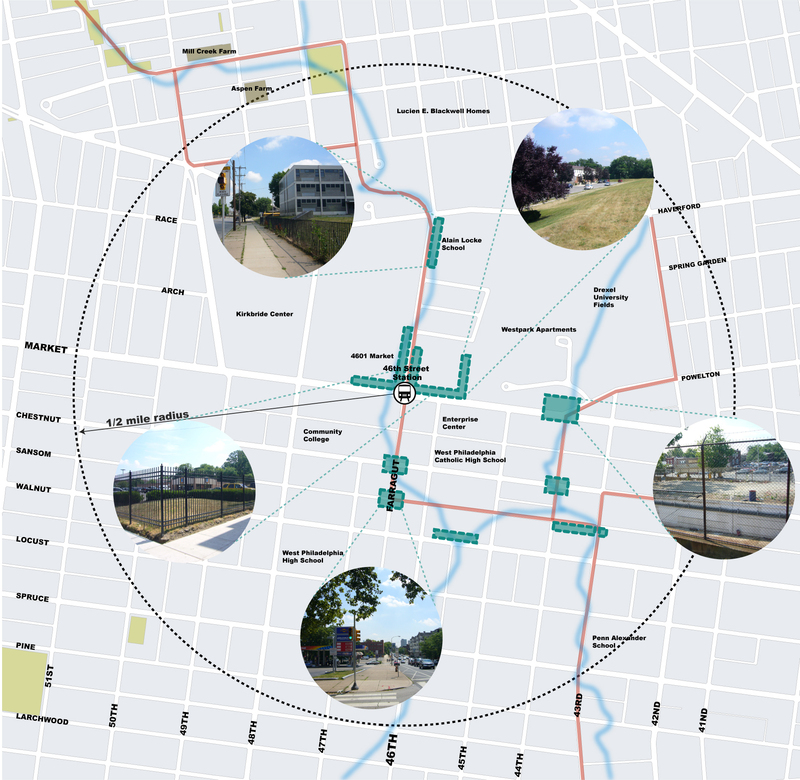 The TRID Master Plan was a pioneering effort combining extensive research, public involvement and design to address the barriers to transit-oriented development and create a more sustainable city. 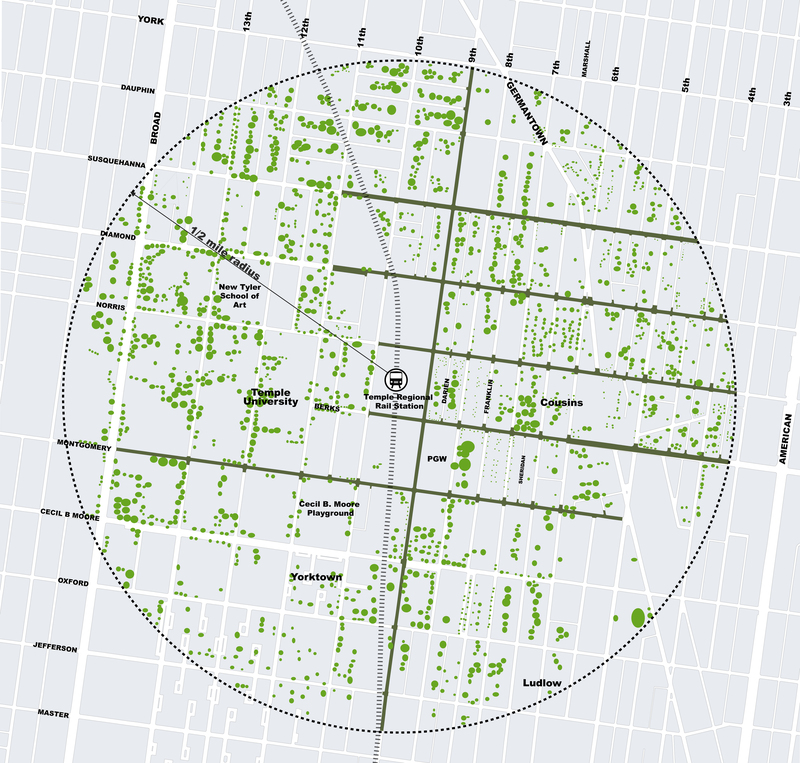 Proposed urban landscape improvements serve as the essential vehicle for establishing a renewed community interface with two rail stations, as well as providing new opportunities for community greening initiatives. Since the expansion of the nation's highway system, public transit has often been relegated to the margins of policy, funding and design. Transit Oriented Development (TOD) is a national movement focused on encouraging growth and development in a way that leverages the value of local transit. 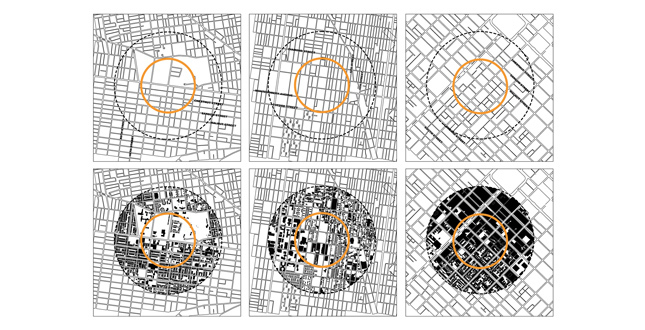 It builds on the fact that those living around transit stations are five times more likely to use transit. The many benefits, including fewer cars on the road, a greater use of transit, and an improved environment, are integral to the process of adapting cities to sustainable systems. Despite an impressive level of transit service, Philadelphia's real estate market has failed to capitalize upon the benefits of public transit infrastructure and proximity. Many stations are surrounded by vacancy, parking lots or former industrial uses which create physical discontinuities between the transit stop and the nearby neighborhood fabric. 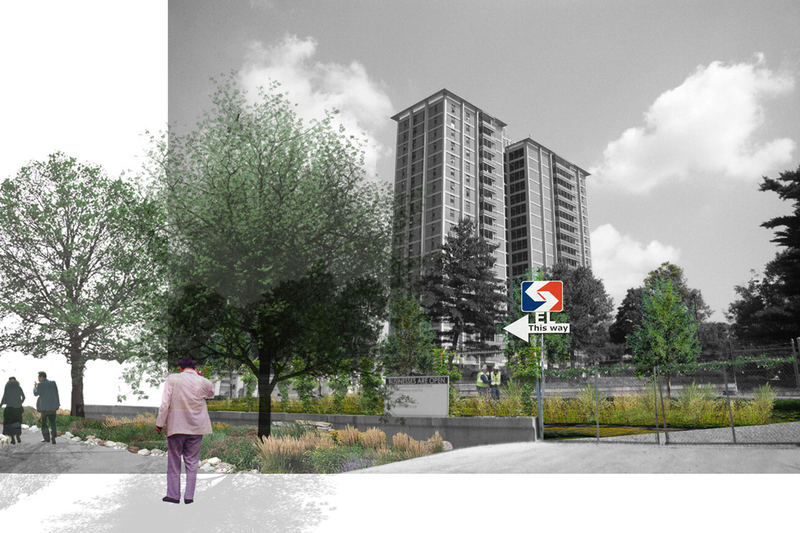 The TRID Master Plan reimagines the underutilized pockets of land as major opportunity sites for denser development with a high level of transit access. Developing a phased approach to physically rebuilding the fabric around each station, incorporating higher densities and new park space. 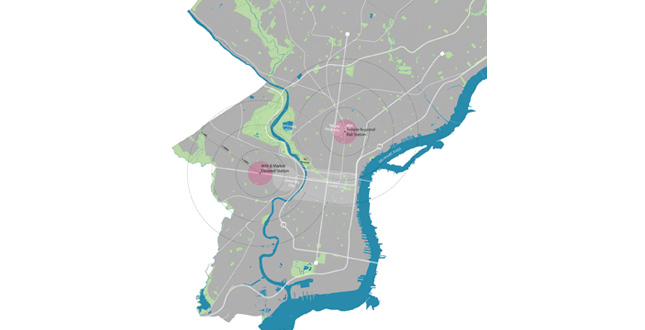 The TRID Master Plan examined two distinct neighborhoods, each served by a prominent transit node in SEPTA's Philadelphia-based transit system: the 46th Street Station on Market Street in West Philadelphia and the Temple Regional Rail Station located at 9th and Berks streets in North Philadelphia. The planning process was designed to develop a collective vision for the future of both station areas—a vision grounded in the intimate knowledge of place shared by those who contribute to its public realm. The research strategy struck a careful balance between quantitative and qualitative, with an emphasis on primary data sources so as to accurately read the pulse of each community, its personality and flow. 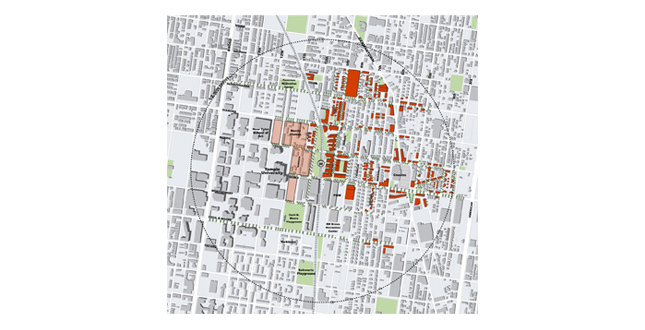 The team developed a comprehensive GIS database for a 1/2-mile area around each station including demographic indicators and assessed values to determine the potential economic impact of local investment. 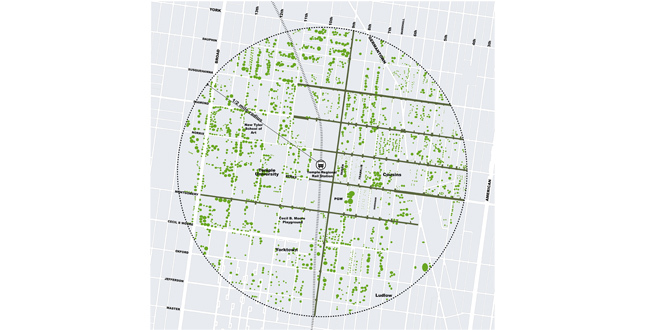 This database was expanded by analyzing information collected through direct observation including a property and business survey, tree survey, a detailed inventory of sidewalk conditions, car counts, and traffic and pedestrian movement pattern analyses. Qualitatively, the team documented invaluable personal narratives by utilizing various forums for direct interaction with community members, collecting anecdotes, memories, and interviews. Public meetings, interviews, focus group discussions allowed the people and place to craft the story of each station, a collective effort yielding place-specific responses. 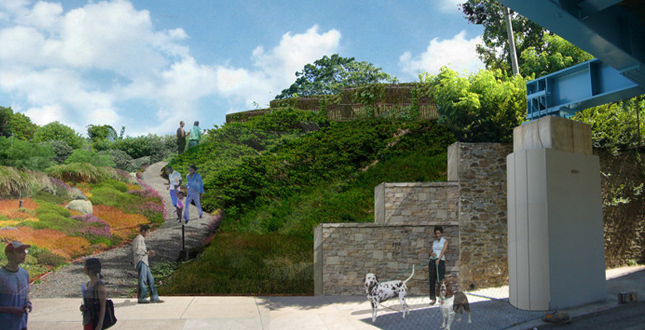 Managing stormwater runoff—At 46th Street, the design drew inspiration from the area's historic water flows. Overlaying a map of the former Mill Creek onto a map of current sewer lines revealed a number of locations where these two systems overlap. 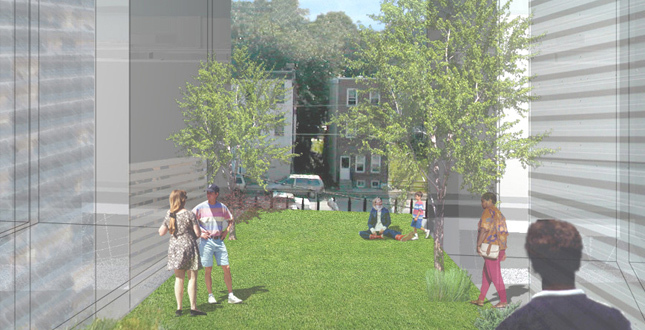 Small rain gardens were designed to mark these moments and create new passive open spaces within the community. Former "slack" space adjacent to the Temple Station was similarly reused to capture rainwater discharge that emanates from nearby parking lots. 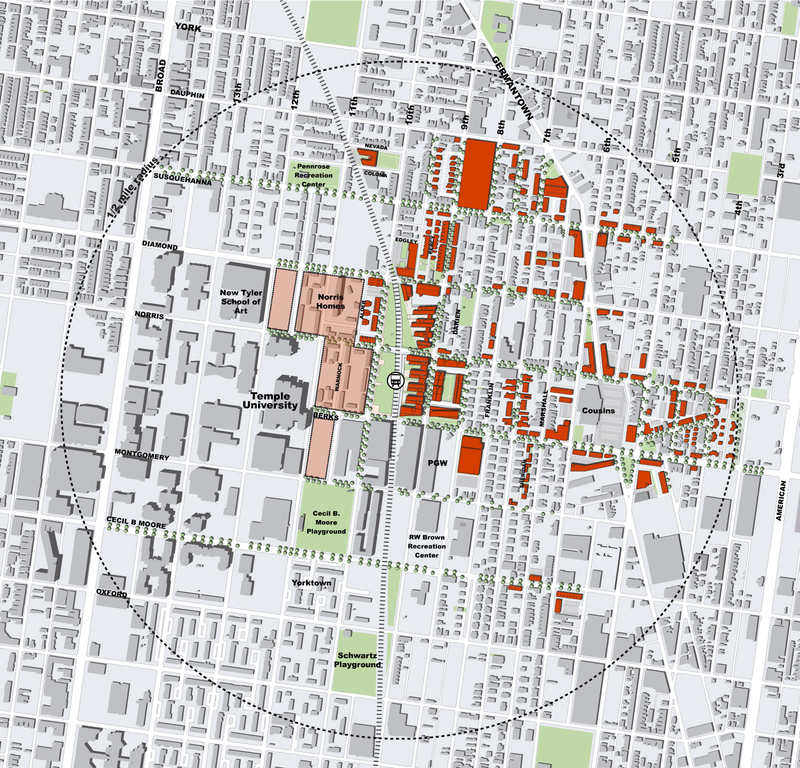 Integrating recreation space—The "superblock" north of the 46th Street Station deprives the area of any real connection with the community. 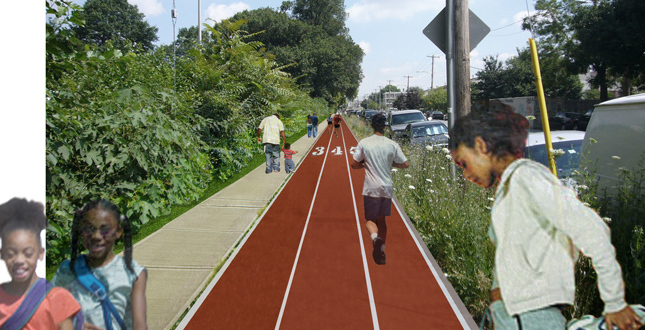 The plan proposes a new running track around the block, transforming unused and overgrown space next to the sidewalk into an active recreation amenity. 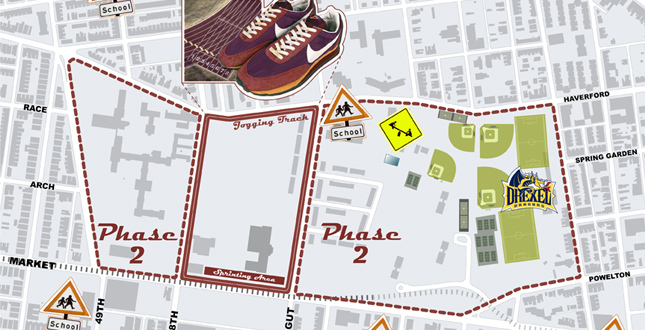 The 1-mile loop will serve two local schools, a recreation center and provide a home for an anti-obesity program—Students Run Philly Style—which trains youth from low-income families for marathons. 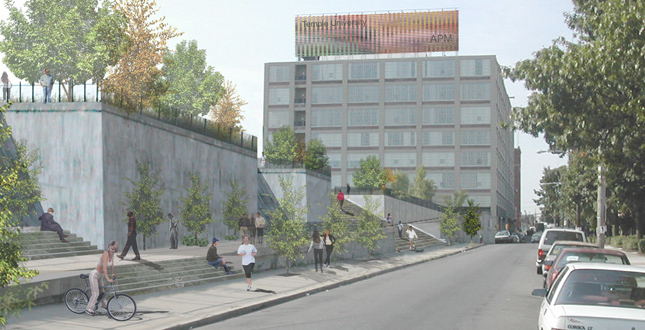 Reimagining infrastructural elements—Adjacent to the Temple Station, the vacant and elevated rail viaduct was redesigned to accommodate a tree nursery that will serve as a productive landscape resource for future greening improvements in the community. A run-down concrete stairwell provides the only means of access to 46th Street Station for a neighboring low-income population. The plan proposes removing this stairwell and reimagines a stronger, safer and more attractive connection. 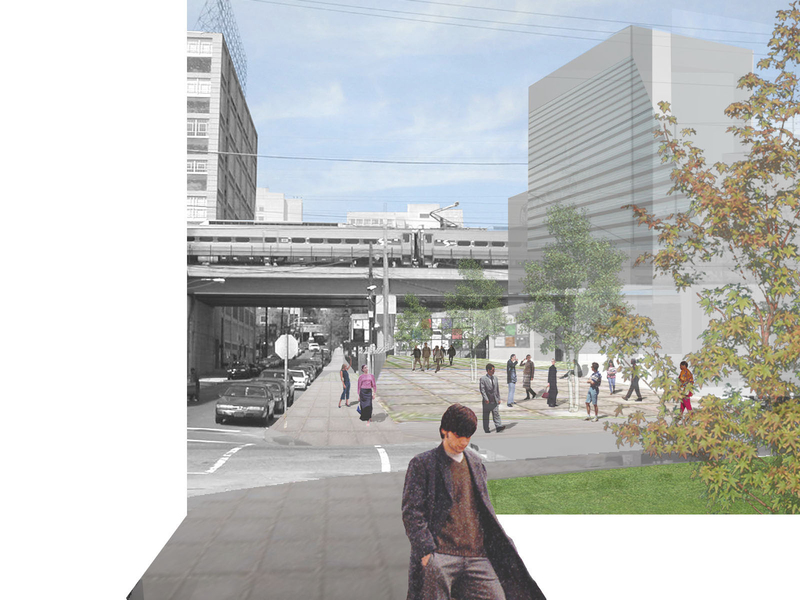 Enhancing connector streets—New tree planting will fill the voids along the barren blocks leading to the Temple Station. 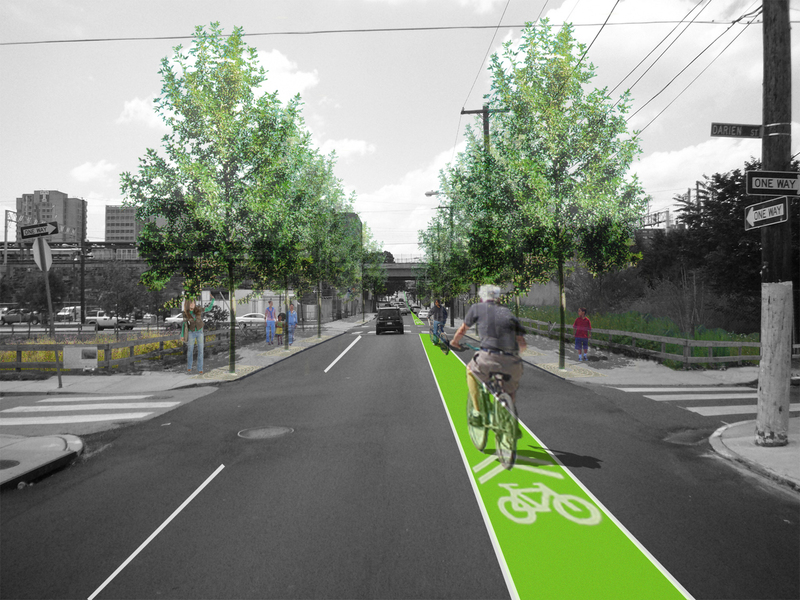 Striping brightly colored bicycle lanes to physically mark the passage to the station reinforces this intervention. Creating civic space at the doorstep of each station—An extension of the plaza under the Temple Station is proposed to accommodate new bicycle parking and a small café. 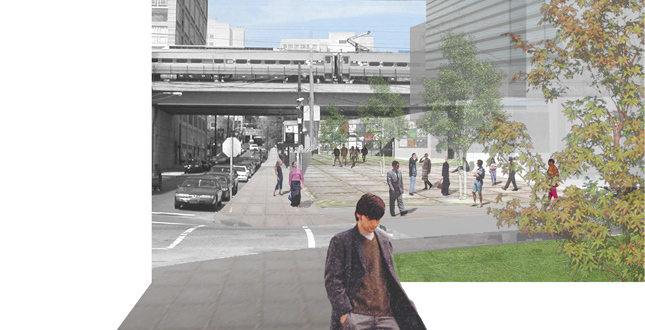 At the 46th Street Station, a small linear park is proposed to establish a diagonal connection to an adjacent major street while providing enhanced views and more direct pathways. 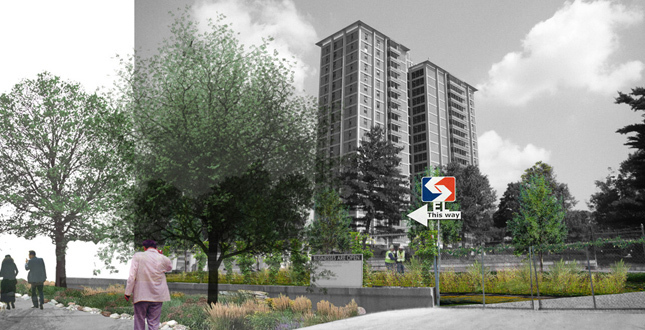 The passage of the Transit Revitalization Investment District (TRID) Act in 2004 by the Commonwealth of Pennsylvania enables cities to "capture the value" of increased tax revenues generated by the increase in private land values resulting from new public investments around each station. Unlike many planning exercises that provide recommendations without offering new financing strategies, the TRID planning study examined the potential financial impact and opportunity of capturing tax revenue generated by incremental new development as identified in the planning process. 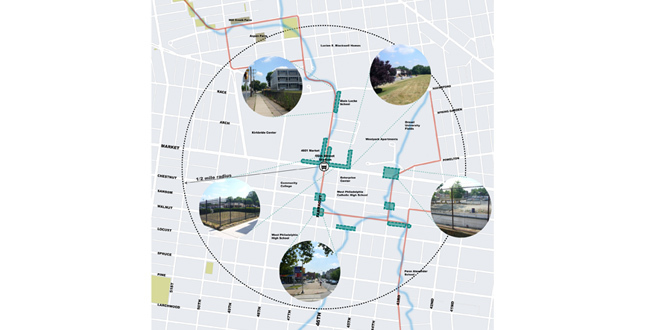 Completed in summer 2008, many of the TRID Master Plan's recommendations have already had a significant impact, thanks in part to an inclusive planning process which brought the City, SEPTA and neighborhood groups to the table to collectively craft the recommendations. Significant implementation activities include the recent award of a $1,000,000 Home Depot Foundation grant for community greening at the Temple Station; the award of $2,400,000 State of Pennsylvania grant to improve sidewalk and bicycle infrastructure; the introduction to City Council of a new zoning overlay district that will remove one of the barriers to developing around the stations; the recent agreement to redevelop a parking lot next to the Temple Station for new retail, student housing and open space; the agreement by SEPTA to reuse the vacant rail viaduct for a tree nursery, and the formation of an "implementation committee" comprised of community organizations, LISC, City Council representatives, Temple University, private developers, the Philadelphia Green Program, SEPTA and city agencies that meet monthly to coordinate and move planned improvements forward.